conference yesterday. 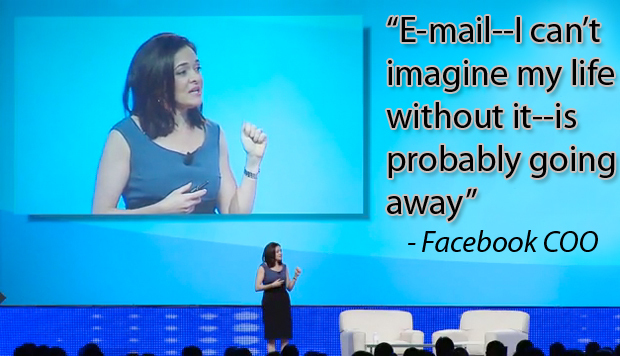 And according to Sandberg, only 11% of teens email daily–clearly, a huge generational drop. Instead, they are increasingly turning to SMS (or Twitter) and social networks for communication. “E-mail–I can’t imagine life without it–is probably going away,” she said. What most drives the effectiveness of social networks is its authenticity, said Sandberg, echoing a claim recently made by Martha Stewart. The COO contended that many join Facebook’s social network because people use their real identities–she also claimed that users join because they entrust the network with personal information (although that may be changing given the company’s many problems around privacy controls of late). Regardless, authenticity on the Web certainly means better word-of-mouth communication for brands. Sandberg cited one study which showed that people who receive product recommendations from their friends are 400% more likely to buy that product. On Facebook, this is encapsulated in the site’s “like” feature. The study also revealed that friend-recommended products have 68% better product recognition and 200% greater memory of brand messaging.